It’s really getting hard to understand if there is any sanity left in the out-of-home (OOH) community leisure venue (CLV) industry, especially for developers of the classic formula family entertainment centers (FECs). We’re seeing daily announcements of all types of new centers. It appears the feasibility logic for the new CLVs is that if you build it, they will come, as if demand for OOH entertainment will expand with the new offering. The fallacy with that is it is a zero-sum game for OOH leisure; consumers will only spend so much time and so much money for OOH leisure and entertainment, and it has actually been on the decline as digital screen and at-home entertainment continues to capture more of their leisure time and money. Every analysis our company has done shows a clear trend of declining, not growing, demand for OOH leisure venues. One thing that’s driving the crazy rate of new centers we’re seeing is the retail apocalypse. All the department and retail store closures have freed up lots of vacant space that landlords want to fill, often at very seductive lease terms. Yes, a little lower rent than in the past and maybe some landlord TI money helps to lower the breakeven point some, but not all that much. To be profitable, CLVs need healthy attendance and spending. And it is very hard to achieve that by building in markets that already meet the OOH demand. Also, much of the vacant retail space is vacant since it is in a marginal market. So, the strategy for all the new CLVs might be to take market share away from the competition by being better. Yes, it might be possible to capture some away from the competition, but in most markets, very little competition is really that bad, and they will still get a slice of the pie. There is a basic problem with the classic FEC model that continues to be developed – the formula of having attractions that appeal to everyone, to children, families and adults. Over the almost three decades since that formula first surfaced, there’s been an expansion and segmentation of CLV types targeting specific demographic groups and types of activities. So, while in the early days of FECs, that formula generated adequate attendance revenues by also appealing to adults since adults had so few other options, today there are all types of entertainment venues specially targeting adults rather than families. Why go to an FEC when adults can go to a venue that is tailored for them such as Top Golf, or Punch Bowl Socialor a Dave & Buster’sas just a few examples of the many options they now have. FECs have basically lost the adult market, a part of the attendance they once had that made them a viable concept. And they are also losing some of the family market to venues targeting adults. Places like Dave & Buster’s, although they have no children’s games, attract families, especially during weekend and holiday daytimes. Another hurdle for FECs is the continuing decline of the birth rate, and with it the number of children and families with children who can be customers. The family market is shrinking. The classic FEC formula that worked in the early days is no longer viable in today’s world. In most of the major markets in the U.S., we are also seeing oversaturation of OOH entertainment options and it just doesn’t seem to stop. Building more CLVs of all types, including FECs, in all but the few unserved markets does not expand the demand. Instead, consumers just spread their OOH attendance, time and money among the increased competition. It’s just plain foolishness out there with the classic FECs continuing to pop up everywhere. First the Australians showed up thinking they had found the magic formula with Main Events. Then the Japanese with Round1. Now we even have an airline company, Allegiant Airopening a chain of 100,000-square-foot G4CEFECs (pronounced “G-force”). And that’s just the tip of the iceberg of all the classic FECs that have recently opened or announced development. Paul Carr, VP of Business Development for Allegiant Travel, the parent company of the airline,said, “G4CEis designed to appeal to all ages. We have something for everyone.” And the company said that includes pre-teens and teens who have few OOH entertainment options. That’s exactly the outdated formula that developers thought was the key to success decades ago. Allegiantalso believes they will have a marketing advantage, as they will be able to market G4CEsto their existing airline customers. What they may have missed is that they are a discount airline appealing to predominately middle- and lower-class customers, who account for the minority of the OOH entertainment spending. A lot of the growth of these new FEC chains is driven by when the first ones opened, they seemed to be successful. That’s because just about any new OOH venue works the first six months to a year as everyone shows up to check it out. That’s doesn’t translate into repeat appeal and long-term viability. The problem is that in today’s social-capital-driven experience economy, people are collecting experiences, especially with so many available to collect. Repeat visits don’t create the social capital visiting a new experience can when shared on social media. This wide growth of CLVs is great for the equipment suppliers, lots of sales. What they don’t realize is that when the bubble breaks, which it will as the market can’t support them all, there will be lots of used equipment on the market, so their sales will go south with all the closures. I guess for industry consultants, when the apocalypse comes, especially for the outdated FECs, there will still be plenty of work, as they will be hired by the failing ones to develop strategies to save them. Unfortunately, not that many will be saved in what is an over saturated and ever shrinking customer base, especially for classic FECs. Offering the coolest bowling or entertainment and/or the tastiest, trendiest burger or flatbread no longer cuts it. Just excelling in quality and experience is no longer enough to assure customer loyalty and repeat appeal. Consumer businesses today have to stand for something that resonates with consumers; they need to have a purpose that is more than selling their products, services or experiences or making a profit. Today they need to be a purpose-driven business. There has been a significant shift in values and purchase intent with a large segment of consumers, creating a new consumer segment often referred to as “conscientious consumers.” They believe a company’s values, actions and corporate reputation are just as important as the products, services and experiences it offers. They prioritize principle over product, service or experience. These consumers increasingly view corporate responsibility, from organic ingredients to animal welfare to company treatment of employees to sustainable practices as aspects of quality, not just a “feel-good factor.” In fact, they often consider purchasing from an ethical company as a luxury and as a status symbol. For them, the idea of luxury is defined far less by expensive possessions than by a set of cultural values. Conscientious consumers cross all ages, demographics and geographies, but skew to Millennials and X-Gens, full-time workers, well-educated, high-income earners and parents. Conscientious consumers are loyal, less price-sensitive and more vocal about the brands and companies they believe in and support. They stay loyal to a company that they believe is trying to do the right thing even if they aren’t fully satisfied with its offerings. Two-thirds will pay full price for a product that supports a cause they believe in or reflects their personal values rather than buying a product at a discounted price from another company. Elizabeth Currid-Halkett, author of The Sum of Small Things, has identified a rising new class in America that is tied to a shared set of cultural practices and social norms who are conscientious consumers. She says this new cultural elite consumer, the aspirational class, is on the rise. They’re people who aren’t defined by their incomes, but rather by their higher education and cultural capital. Currid-Halkett sees these consumers as driven primarily by an aspiration to acquire knowledge and to then demonstrate that knowledge by socially and environmentally conscientious values and behaviorsThey share a set of beliefs on the most socially conscientious ways to spend money that becomes a significant part of their identity and social capital. Aspirational class consumerism is rooted in the value of “conspicuous production” – transparency in the production and processes that create socially and environmentally responsible offerings that is inherent to the value of most of the consumer offerings they purchase. To them, the sourcing, the production, the creation of the offering is the value. In marketing, it used to be about the four Ps—price, product, promotion and place. Now with conscientious consumers it needs to include a fifth P—purpose. Just having a great product, service, or leisure or entertainment experience is no longer sufficient to succeed today. What a company stands for, its purpose and its social, ethnical and environment actions, its social accountability, has now become integral to its offerings’ benefits. There is now a blurring of the lines – people are blending their consumer choices and their beliefs and values into one. This blending of consumerism and social conscientiousness has created expectations about how products are grown and made, how employees are treated and how the environment is impacted. Being a purpose-driven good-citizen business is no longer something companies can shy away from if they want to be a purchase option with consumers. This significant segment of consumers is a significant force that any consumer company needs to understand and address today. Social good has become the new cool. An excellent example of how important these values have become to the success of consumer products, services or experiences is demonstrated by Budweiser’s 2019 Super Bowl commercial. Budweiser spent $5.0 million dollars and didn’t tell you a thing about the taste, calories or ingredients of their beer. Rather they told you the story of its environmentally responsible production by wind power. While other beer brands shamed each other for their ingredients during the Super Bowl, Budweiser stood out above the rest by telling you the story of its environmentally responsible production and its commitment to brewing 100% of its beer with 100% renewable electricity from wind power. They’ve raised the whole value perception of their beer. Meeting conscientious consumers’ values is just as important today for location-based entertainment and leisure venues. These consumers skew heavily to higher educated and higher incomes, a demographic that accounts for the large majority, 70% of all entertainment spending at destination entertainment venues such as FECs, eatertainment, bowling and laser-tag venues and at agritourism/agritainment farms. Yesterday Dave & Buster’s reported record revenues in the third quarter, up 12.9%. Sounds all rosy, but it really isn’t when you drill down into the results. The revenue increase is attributable to an increase in the number of stores. And even with the increased revenues, net income decreased by 2.5%. Even more telling is that comparable store sales declined 1.3% compared to the same quarter one year ago. However, that does to reflect inflation. With inflation factored in, the comparable store decline is more like 3%. The comparable store sales decline was driven by both a decrease in walk-in and special event sales. As we reported in the November issue of our Leisure eNewsletter, Dave & Buster’s is experiencing a long-term trend of comparable store declining food and beverage sales that started in Q4 of 2016. The just reported results for the last quarter continue that trend with a comparable store sales decline of 5% for food and beverage, which declined to 42.1% from 43.1% of all revenues one year ago. Today the success formula for eatertainment venues such as Dave & Buster’s is great food and drink – high quality, scratch-kitchen, fresh and innovative – combined with noteworthy, memorable experiences. Food and drink have taken on an importance even greater than the attractions and games at eatertainment venues. So as a result of Dave & Buster’s out-of-date food offerings, consumers are either just staying home or visiting other leisure and eatertainment options such as the new school eatertainment chains such as Top Golf and Punch Bowl Social, both of whom have far superior food. 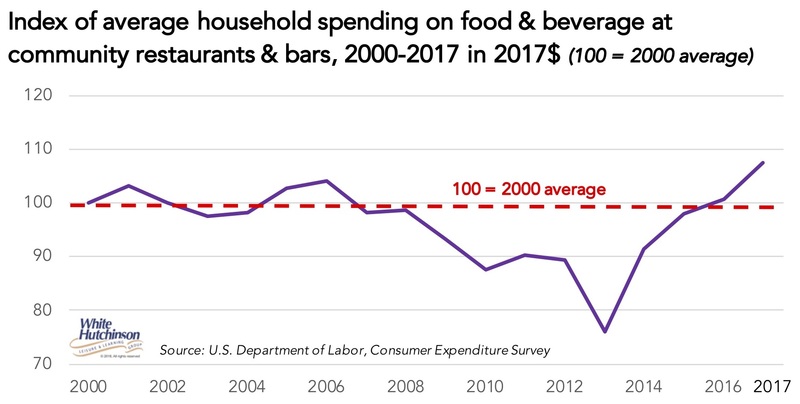 In 2017, average household expenditures at community-based restaurants were at an all-time high since the turn of the Century when adjusted for inflation. 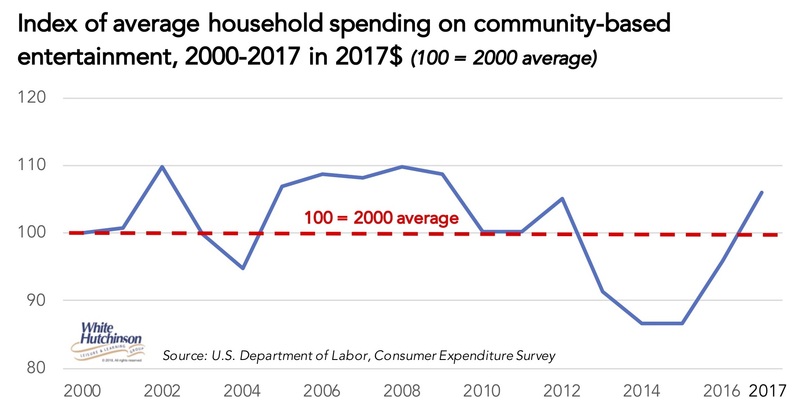 For the first time since 2013, average household expenditures at community-based entertainment grew higher than spending in 2000. However, spending changes were not equal across all sociodemographic and age cohort groups. Our October Leisure eNewsletter will have more in-depth analysis. If you haven’t subscribed to the eNewsletter, you can by clicking here. I’ve had it! This is absolutely insane, continually stereotyping generations (GenX, GenY, GenZ and Baby Boomers) as if everyone in them is the same. The latest push is now article after article about GenZ. I guess the good news is that we will stop being inundated with article after article about GenY, also known as Millennials. Right now, Google shows over 93 million results for Millennials and only around 4 million for Gen Z. However, the count for Gen Z appears to be rapidly growing. GenZs, also known as Centennials or iGen, are defined to be between ages 8 and 22. Just consider how crazy one article is that just cited, “GenZers hand over more money for food and drink than any another spending category (including clothing)” Get real! Did they survey how an 8-year-old spends her allowance money (maybe on candy, but certainly not on clothing) versus how a teenager does versus how a 22-year-old medical student does? You can’t lump them all together in a survey without getting mush. It doesn’t tell you anything. It’s no different with Millennials, who are currently between ages 23 and 38. What does the spending habits or lifestyle of a 23-year-old college grad single male who is an apprentice at some Wall Street firm living with his parents in a condo in Manhattan have to do with a 30-year-old high school graduate childless couple who work in manufacturing and live in a small town apartment or with a graduate degree 38-year-old couple, one of whom is a doctor, with two children living in a home in an upscale suburban neighborhood? Yes, there may be some common traits that some portion of each generation has, but they do not necessarily apply to everyone in that generation nor are those traits limited to that generation. Yes, a very high percentage of Millennials have smartphones, but Baby Boomers also have smartphones, just not as high a percentage. I remember an experience I had over a year ago when I first started using Apple Pay at stores. I’m no Millennial, way past their age. I used Apple Pay to pay for some groceries. The young Millennial cashier watched me do it and had an expression on her face like I was from outer space doing some sort of magic. She had never seen Apple Pay before and didn’t know what it was until I explained it. So, who was so tech savvy like the literature leaves us to believe? It sure wasn’t all the Millennials and it sure wasn’t limited to Millennials. Let’s stop all this craziness using GenX, GenY, Gen Z and Baby Boomers as generational stereotypes and start surveying and defining consumers’ characteristics and habits by more realistic tighter age groupings, their sociodemographics, lifestyles, and other traits that are far more defining and revealing. Our recent issue of our Leisure eNewsletter included the article, Where have all the babies gone, that discusses the continuing baby bust, the continuing decline in the birth rate since 2007 that has resulted in the birth of 4.9 million fewer babies than if the birth rate up to 2007 had continued. One of our readers wrote this back to us: “I just wanted to comment on your article about fewer babies. Over Father’s Day weekend, we had a long discussion with our younger son John and his wife Diana (ages 33 and 32). They don’t plan to have any children and quickly listed five couples that they know who are also not planning to have children. They are all college educated with good jobs, but they look at the world and don’t want to bring a child into it, because they all think the world is only going to get worse, not better, especially in terms of the haves and have-nots, and they believe the have-nots are only going to get more violent. All of the couples I’m talking about would be great parents, but they’ve intentionally decided not to have children, including the adoption option. I can’t tell you whether the above is the primary cause for the baby bust, but it sure makes you think about where younger adults think the worldis today and headed in the future. Yes, it is a little scary. Posted in Births, Culture, Demographics, Disruption, Household composition	| Comments Off on Where have all the babies gone? Virtual reality isn’t just an exciting new technology. It’s a new type of media and a game changer that has high potential to change the way we live, especially our leisure lives. streaming live VR sports and entertainment events to our living rooms. Sportsnet will offer 360-degree virtual reality of NHL games. And coming soon will be eSports. Next year you’ll probably be able to watch the entire Super Bowl in 3D virtual reality. This is just the beginning of all the new live steaming VR at-home sports and music experiences that will be available to enjoy from our personal immersive caves. Right now the VR headsets are still big, bulky, heavy and basically uncomfortable. The maximum time that most people will wear them with great content is around 35 minutes. But that is quickly changing. 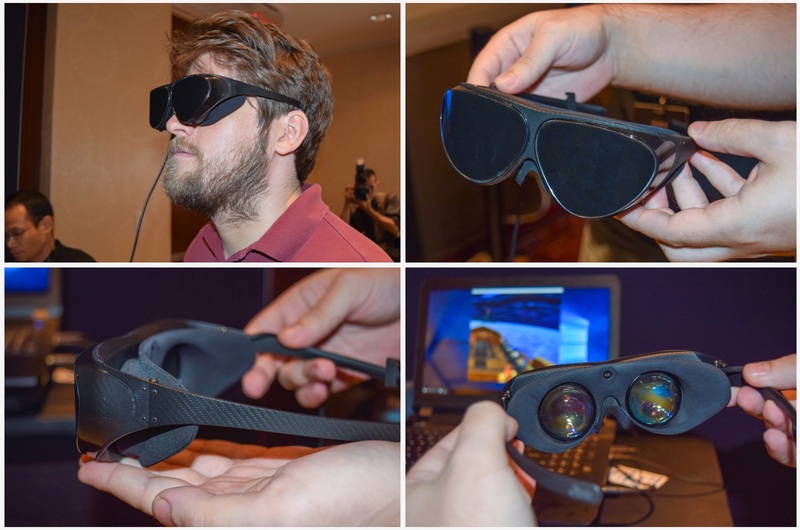 In the near future headsets will be very light and comfortable, the equivalent of wearing a pair of glasses, enough to wear for an entire event. VR glasses will be coming out this year that only weight about 5 ounces. With that and reasonable VR glass prices, 360 VR can really go mainstream. So there is no doubt livestreaming 360 VR will disrupt the sports and live music and entertainment industries. All the more reason to stay home rather than attend. So why am I writing about the sports and live entertainment industries when our company predominately works with out-of-home community leisure venue (CLV) clients, which includes family entertainment centers (FECs) and entertainment venues that include bowling, laser tag and other interactive games? It’s real simple. If you had owned a CLV around two decades ago, in terms of competition, you only worried that someone wouldn’t open a new center down the street. Your competition was limited to bricks-and-mortar locations. That has all changed today. Today, if you own a CLV, your competition is just about everything else people can do with their leisure time, and that includes just staying home with all the digital technology options available today. The CLV industry is undergoing disruption no different than retail stores are with ecommerce and the movie industry is with live streaming Netflix onto the living room HDTV. Unfortunately, no different than the retail industry just a few years ago, most CLV owners haven’t recognized the growing disruption from digital at-home entertainment. With 360 VR it is going to get a lot worse and those that don’t respond will lose market share, no different than the noticeable loss of market share Amazon and ecommerce is now having on retailers. So you don’t think livestreaming VR sports and music events is competition to CLVs? Here’s why it is. People have a choice to go out or just stay home. Going out takes far more time, effort and money than staying home. You have to travel to some venue, which takes time and has cost. Stay home and all that time is saved. Maybe you don’t now go to live music events due to the time it takes and cost. With livestreaming VR you will be able to immersively enjoy them in your living room. So do you stay home and enjoy the music concert in 360 VR or do you go out to some CLV? Many people will take the path of least resistance. 360 VR is what I call the digitalization of place. The digital world brings the place into your home. Yes, it’s still only visual and aural immersion, not total physical immersion, what is called total presence like on Star Trek’s Holodeck. But it is a whole new superior experience compared to the 2D viewing options we have been previously limited to. If you follow my blogs and our company’s Leisure eNewsletters, you’ve read that consumers make leisure choices in terms of the trade-off between Fidelity, the quality of physical out-of-home experiences, and Convenience, the ease of access in time, effort and money the digital world offers. The more Convenient digital leisure options become, the higher the Fidelity of an out-of-home experience has to become to compete and attract people. What livestreaming, or even non-live 360 VR is doing, is adding an improved fidelity component to Convenience, dramatically raising the bar that a CLV experience will have to achieve to get people away from their VR glasses and out of their homes. We previously said you had to be High Fidelity to get them out of their homes. With the mainstreaming of 360 VR, CLVs will now need to become ULTRA High Fidelity to compete with at-home VR experiences that will become mainstream in the very near future. Back in November, in my blog, First mover doesn’t succeed unless its also best mover, I compared two first mover community-leisure center (CLV) chains that are rolling out centers across the country, Main Event Entertainment with its new model, and Top Golf. Main Event was the example of a first mover that wasn’t a best mover, whereas Top Golf was the example of a best mover. Point Orlando, a 408,000-square-foot retail-restaurant-entertainment destination on International Drive in Orlando, Florida, originally opened in 1997 and has been under redevelopment since 2007. As part of the redevelopment, it needed another entertainment anchor to drive footfall. Its owners, Brixmor Property Group, finally landed Main Event by making 48,000 square feet available on the ground level under the Regal Cinema IMAX theater. However, the space was not the standard size, dimensions and shape of Main Events’ prototype big box centers they are building from the ground up everywhere else. For one, the space was longer and not as deep. It also had lower ceilings. This forced Main Event to change its design. I had a chance to visit the center several weeks ago. It looks like Main Event’s need to come up with a different design to fit the space at Pointe Orlando may be its good fortune, as the center is a major improvement over its big box prototypes. For one, with a lower ceiling, the space is more intimate. You don’t feel like you are in their typical high ceiling, wide-open big box. Different areas have more definition, rather than just being spread out on a big box floor where you see everything from one location. They also did something smart with their bowling. They put family bowling at one far end next to the gameroom and ropes course. At the other far end is the adult area with billiards and an adult bowling area. The bar and restaurant areas separate the family and adult areas. So although they continue to try to follow yesteryear’s FEC model of serving two markets at once, families with children and adults (no longer the most successful formula in the evolved specialized age of CLVs that focus on one niche market), at least the two different areas are a better match for each group in terms of separation and specialization. With the lower ceiling and the different space shape, Main Event ended up with more walls that allowed for far more attractive interior finishes. In fact, they definitely upgraded the interior feel of the space. They still haven’t mastered how to be a destination restaurant, especially with the design, as the restaurant area is just one big space with the tables spread out in a large open area, not very intimate in feel. On the plus side, they do have an outdoor patio area. The food was mediocre at best. My pizza had what at least felt and tasted like a frozen par-baked crust. The crust was almost tasteless. Point Orlando has many high quality restaurants including Copper Canyon Grill, Maggiano’s Little Italy, The Capital Grille, Tommy Bahama & The Oceanaire Seafood Room. Compared to all the other dining options at Pointe Orlando, Main Event will have little appeal as an adult dining destination, although I can see it working for families. And in terms of adult entertainment, Main Event is competing with Dave & Buster’s and King’s, both just 5 minutes away up International Drive. They each offer free parking, whereas it’s pay parking in Pointe Orlando’s garage, $6 for 2-3 hours and $8 for 3-4 hours. In terms of the expectation for quality food in a bowling-based venue, Splitsville Luxury Lanes in Disney Springs has set the standard in Orlando. It even serves sushi. Main Event’s food comes nowhere close. One thing Main Event continues to completely fail at is acoustics. At Pointe Orlando, they did nothing to address it. They didn’t even use carpet throughout most of the center, including in the gameroom (a standard industry practice), which can help moderate poor acoustics. I’ve heard from some residents in Orlando that on a busy night it is almost impossible to hold a conversation. Main Event still doesn’t understand that the primary reason people go out to CLVs of all types is not necessarily the entertainment, it is to socialize. And that requires being able to hold a conversation without shouting. One potential problem the Pointe Orlando center may cause Main Event is that it is nicer than their other locations. Since Orlando is a major tourist destination, many customers from their other locations come to Orlando on vacation. After visiting the Pointe Orlando Main Event, they’re expectations are raised for what to expect at a Main Event, so when they go back home, they could be less satisfied with the Main Event in their home town. Customer satisfaction = what customers expect minus what they actually experience. This is not good for Main Event, especially since their same store sales for the six months ending December 31st were down 2.9% while other entertainment chains like Dave & Buster’s saw increases (+1% for D&B’s 2nd quarter and +5.9% for their 3rd quarter ending October 31, 2016). Despite its flaws, the Orlando Main Event is a clear contrast to the typical FEC big box model they are rolling out with their built-from-scratch new centers. The Orlando Main Event clearly shows how inferior the big box model is in many respects. 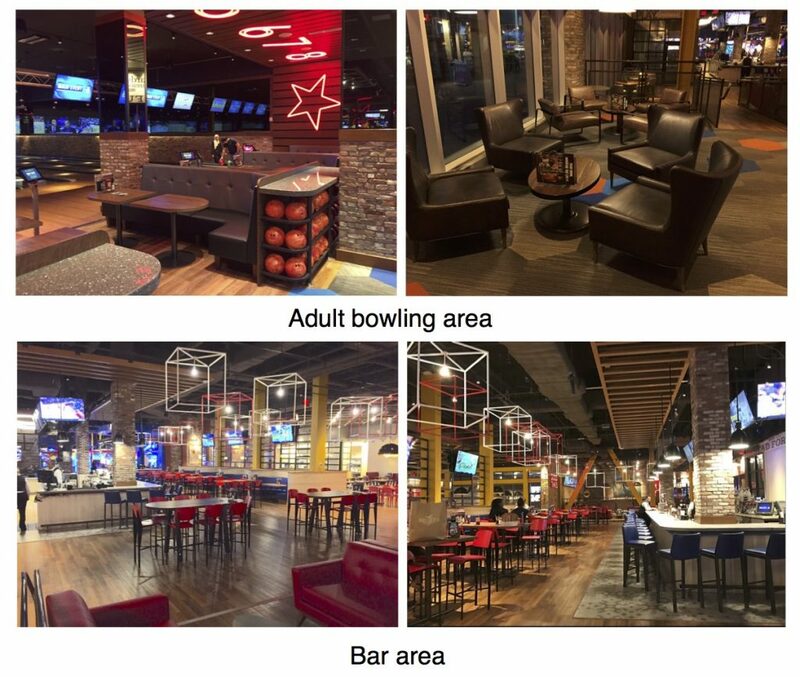 In the community leisure venue (CLV) industry, which includes what are commonly known as FECs, hybrid bowling and laser tag centers, we are seeing new concepts and business models emerge. The conventional wisdom in the industry is that first to market can establish a stronghold in the market, a first mover advantage, making it difficult for later entrants to capture market share. 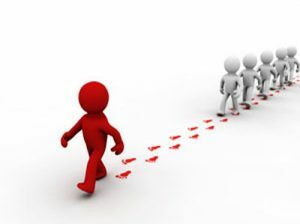 However, a first mover advantage is never a sure thing. 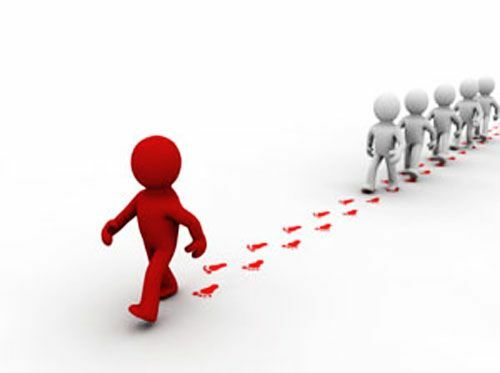 Being a first mover at the expense of being the best mover will often lead to a competitive disadvantage. Today we are seeing new entertainment-oriented CLVs, the classic FEC models, only making incremental changes as they view their only competition as existing FECs; they look at what their competition is doing and try to up the ante, get a little better. The problem with this approach is that since the turn of the Century, the pervasiveness of the Internet, social media and mobile devices has caused seismic shifts in peoples’ tastes and how they live, learn, work, socialize and engage in leisure activities. As a result, the new FECs are only tweaking legacy business models from bygone days when the consumer and the leisure landscape were far different. And the accelerating pace of technological and digital innovation means that evolution is still underway. Legacy FEC models, even with improvements, don’t match the values, preferences, behaviors and aspirations of the current and future digitally connected leisure consumer. That approach is destined for failure. As a result of having so many out-of-home leisure options plus so many at-home and screen-based social and entertainment options, today the winning formula for a CLV now requires competing with every other option consumers have for where they can spend their limited leisure time and discretionary spending. That now means best to market has to be best compared to all those options, not just better than the FEC down the road. To be relevant and compelling to the evolved leisure consumer means letting go of the past FEC models developed in a completely different era for a completely different leisure consumer. Today that requires offering what is a High Fidelity, social, food and drink and entertainment experience, not the legacy model of almost totally focusing on entertainment attractions. As a result what we are now seeing emerge are completely new and innovative CLV business models. Here’s a comparison of two fast-expanding CLV chains trying to gain first mover advantage. One is still stuck in the past with nothing more than a tweaked FEC model, while the other has developed a completely new, highly relevant best mover CLV business model. I’ll look at Main Event Entertainment. It’s new owners, Ardent Leisure, a publically traded company based in Australia, bought the company in 2006. In 2012 they started rolling out a new Main Event model completely different than the existing centers they purchased. There are currently 18 of their new model FECs and Ardent says they plan to open at least 100. The company says their basic strategy is to get first mover advantage in 2nd tier cities. The problem with their strategy is they will probably lose whatever advantage they may first gain, as they are not best to market in today’s leisure market. The new Main Events are just a tweaked version of the old classic FEC model and the later hybrid bowling model, which are fast turning into dinosaurs. A second problem with their approach is it tries to be attractive to both families with children and adults coming without children. Today trying to be all things to different types of customers is no longer a winning formula. Additionally, their centers are noisy big boxes without a strong contemporary destination food and drink component. That’s yesterday’s formula only tweaked with a flashy storefront and some minor improvements. To win today you need to zero in on a target market rather than cast a too-wide net. The facility has to have great design, great hospitality and offer a great social experience with a major, significant, appealing food and drink component. To win today, a CLV also has to be designed to have high appeal to a higher socioeconomic customer than in the past. Middle income families are no longer the viable target market. Today, the top 40% of income households account for almost three-quarters (72%) of all spending at CLVs. Ardent Leisure is also making a classic mistake with their new model rollout. They are just cookie cuttering an unperfected model as fast as possible. They are rolling it out so fast they don’t have the time to learn from the early units on how to improve the later ones. Apparently their new centers are losing their appeal as Ardent has reported a 1.7% decline in same store sales while most other CLVs are seeing increases with the improving economy (actually the decline is more like 3.5% when adjusted for inflation. In fact, the same store decline for the new models is probably worse, as the same store sales figures include the original model Main Events that are well established.) This is a case of the classic sophomore slump. You really don’t learn how good a new model is and what is required to make it successful until later into its 2nd year. Just about any new center does well when it first opens as everyone checks it out. The big issue becomes will people consider it attractive enough to come back and promote it to their friends and on social media. That’s why new models take years to perfect. That is probably what’s happening to the new Main Event model that is not evolving. A permanent sophomore slump is slowly rolling through the new units. What we may be seeing with Ardent Leisure’s rapid expansion is a classic case of corporate hubris expanding a flawed model. In Main Event’s case, first to market is not best to market. Right now in many markets they are the best of the worst compared to other FECs, but certainly not best to market compared to consumers’ many competing leisure options. Furthermore, the new Main Events are extremely vulnerable to new truly best to market CLV models entering their markets. Just the opposite is true with TopGolf. TopGolf has taken the golf practice driving range and disrupted its model to create a completely new first to market, but also a best to market leisure venue for adults. It’s not about golf, as they’ve taken the sport out of golf. The majority of their customers are not golfers. And they have created an experience focused on adults, not one designed for multiple target markets like Main Event. They’ve turned whacking a golf ball into a contemporary social game for the digital age. No matter where you are in the facility or what you’re doing, food and drink is a fundamental part of the experience. The experience at TopGolf is not about entertainment anchors like at Main Event. Rather it’s about a great social experience whacking golf balls while enjoying food and drink with friends. Today, the winning best to market models are about great social experiences facilitated by interactive social games paired with great food and drink. There are other game-changing new CLV models in addition to TopGolf opening in many markets. And interestingly, they don’t focus on the entertainment, but rather on creating a great social experience. Some even have the word social in their names. So the bottom line is very simple. Being first to market won’t give you a long-term advantage unless you make sure you are also best to market. And today, the bar is very high on what it takes to be best to market, as best means in comparison to every other type of social, dining and drinking and entertainment leisure option, out-of-home as well as at-home. If you don’t meet that best to market standard, consumers will decide you really aren’t that good, attendance will decline and soon a new best to market concept, such as TopGolf, will take an even larger share of your business away. This is exactly why a number of years ago our company changed the direction we were taking our clients’ projects. Rather than just tweak some out-of-date legacy model and focus on the entertainment like traditional FECs, we’ve focused all our design and production work on offering the higher socioeconomic market a High Fidelity social experience build around top quality contemporary food and drink and interactive games. TopGolf and other new model CLVs are proving this is now the first and best to market formula for long-term success. Pokémon Go is the hottest craze right now and is quickly becoming one of the most viral mobile applications of all time. Eleven percent of U.S. Android owners have installed the app and six percent are engaged in the game on a daily basis, staring at their phone screens as they walk the streets looking for animated characters. Pokémon Go use now surpasses Twitter’s daily users. People are spending more time in its app than on Facebook. Besides being the hottest new mobile game and a major phenomenon, it’s most significant impact is that it has introduced of a totally new disruptive technology to the consumer entertainment landscape. * Pokémon Go represents one of those moments when a new technology, in this case augmented reality, breaks through from being a niche use by early adopters to going mainstream. 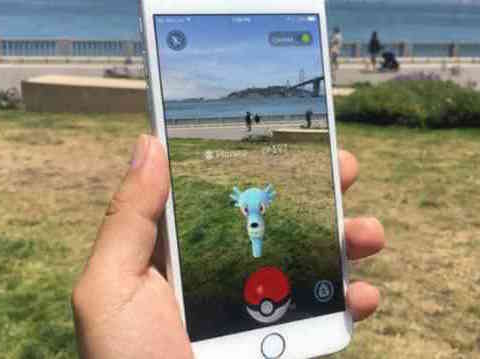 Pokémon Go players move through the physical world following a digital map on their screens, searching for cartoon creatures that appear at random. They look through their smartphone cameras to find Pokémon. When an animated creature appears, they toss Pokéballs at it until it is subdued. (If you haven’t yet been caught up in the Pokémon Go craze and want to learn what the game is all about, check out this video). Up until now entertainment options where basically limited to board and card games, 2D screen-based entertainment and games in the home or on the mobile screen, and visits to entertainment venues. Pokémon Go has now brought the mixed reality of combining augmented reality and real world reality to everyone. Why is it so disruptive? Because it has expanded screen-based entertainment and game options into the entire real 3D world. Previously the only 3D real world options were available at an entertainment venue. Pokémon Go has now shown us that the entire world can be the entertainment venue. The fidelity of the game is so much higher than playing on a 2D screen. The game is free and pokécoin purchases are very inexpensive. It is social at Pokémon Go gym locations. You no longer have to pay to go to an entertainment venue to play a game or be entertained in the real world. Pokémon Go is only the beginning of the mixed reality entertainment options that will be emerging in the near future. It is also the future of how we’re going to interact with computers. Augmented reality entertainment will be slicing into the available market pie of consumers’ available leisure time and discretionary spending. 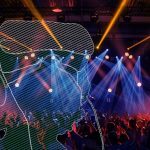 This mixed reality is a completely new form of competition that location-based entertainment venues need to take very seriously. To continue to attract paying customers, entertainment venues will need to raise the quality, the attractiveness, the Fidelity of the entertainment and social experiences they offer. * The first augmented reality video game was Ingress by the same developers of Pokémon Go, but it never captured a large enough fan base to attract a mainstream audience.